Find It Fix It Drive It, a new 10-part series from the team behind Shed & Buried and The Motorbike Show, is coming to TV screens in March. 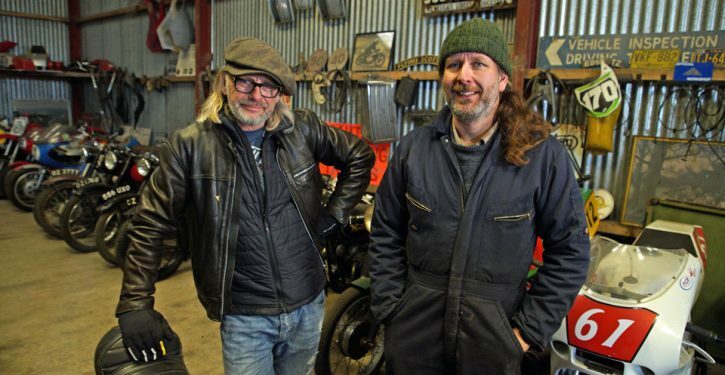 Find It Fix It Drive It follows classic vehicle obsessed TV presenter Henry Cole and his best mate, the engineering genius Sam Lovegrove, as they set out on a mission to ride, drive and compete in some of the craziest challenges they have on their bucket lists. In each episode Henry & Sam will scour the nation’s sheds to find and buy the perfect vehicle for the job in hand. The pressure will then be on to get it restored in time for the big challenge ahead. Henry and Sam need to find a classic tractor for a ploughing championship, a motorbike for the UK’s biggest custom show, something to traverse the Welsh Valleys off-road, a pre-war boat tailed race car to take on the banking at the World famous Brooklands and a vintage race bike to do a lap of the Isle of Man TT Mountain course, to name but a few. For laughs, tears, classic vehicles, restoration and a couple of old friends taking on endeavours they should know better than to be involved in, tune in to watch the first episode of Find It Fix It Drive It on More4 at 9pm on Wednesday 27th March. To find out more and apply to be included in future programmes, visit www.henrycole.tv.